WASHINGTON (CNS) — Although priests and women religious say a variety of reasons led them to pursue their vocation, one thing many of them have in common is that they went to a Catholic school. Attending Catholic school certainly isn’t a magic bullet that leads to a vocation but for some it proved that a religious vocation was not only a possibility but also looked appealing because of the example of priests and women religious they saw on a regular basis. That was the experience of Dominican Sister John Mary Fleming, a member of the Dominicans’ St. Cecilia Congregation in Nashville, Tennessee, who is the executive director of the Secretariat of Catholic Education of the U.S. Conference of Catholic Bishops. Sister John Mary is convinced she wouldn’t be a sister had it not been for the example of the women religious who taught at her school, Providence High School in New Lenox, Illinois, which was a Joliet diocesan school at the time and is now run by the Augustinian order. The teachers there in the 1980s came from five to seven women’s orders and men’s congregations along with diocesan priests. Their example — of living their faith and being happy — “debunked the myth that living a faith-filled life was not a happy thing,” she told Catholic News Service. The bishop, who was ordained a Jesuit priest in 1979, said he wanted to be like his parish priest and the priests who taught at his high school. 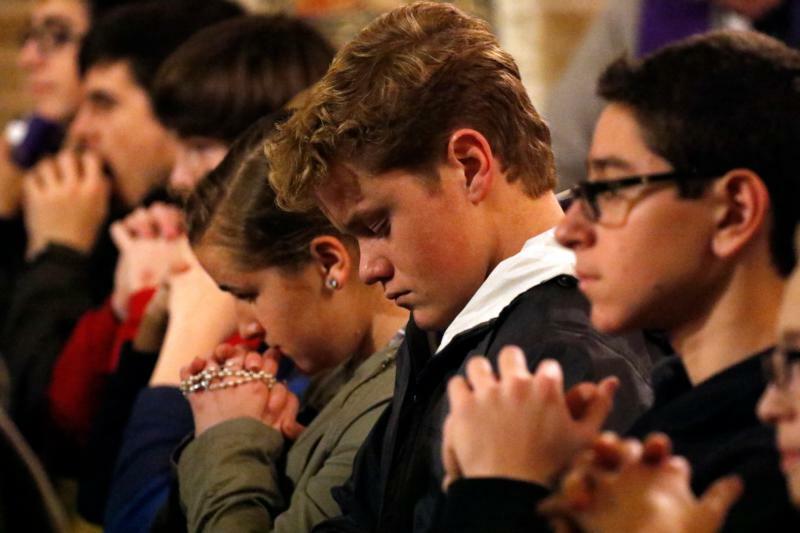 “I saw them as happy people — people we could put our trust in; day after day at the school or the parish, they were helping us and guiding us,” he said. These experiences confirm a 2014 study by the Center for Applied Research in the Apostolate based at Georgetown University that linked Catholic schools to vocations. The report: “Catholic Schools in the United States in the 21st Century: Importance in Church Life, Challenges and Opportunities,” points out that half or more of new priests and brothers attended Catholic primary schools as did 41 percent of new women religious and 45 percent of young lay ministers. “If fewer and fewer Catholics enroll in Catholic schools, it will become ever more challenging for the Catholic Church to foster vocations to the priesthood and religious life,” the report said. “I, too, try to share the joy that was shared for me,” she told CNS in a phone interview at the end of the school day Jan. 12. She said she does that by building relationships with the students and answering all their questions about what it’s like to be a sister. Sister Regina Marie, who teaches second-grade religion at four different schools in Lincoln while also working as general treasurer for her community, similarly was impressed by both the “normalness and the prayerfulness” of the sisters who taught her. She said she doesn’t promote vocations with her young students but she impresses on them that they need a foundation of prayer. “I want them to know they need to pray — that God is real and he wants to talk to them. If there is a religious vocation for them and they have a foundation of prayer, it will be that much easier to understand,” she said. But even when Catholic schools aren’t staffed by women religious or priests — as is often the case today, the vocation message is still getting out. Father Mark Ivany, director of priestly vocations in the Washington Archdiocese, said a Catholic school in the Washington Archdiocese — St. Mary’s Ryken High School in Leonardtown, Maryland — has had a high rate of men entering the priesthood in recent years. For example, of the 11 men who entered the minor seminary in the Archdiocese of Washington last year, five were from that school. “Catholic schools teach us how to truly give ourselves to one another — as students and as teachers. In doing so, they plant the seeds for vocation in all of us,” he wrote.